When do I start making sculpture?" asked Garth when he was studying under Professor A. H. Gerard at the Slade in the late 1950s. Frustrated by being expected to follow a curriculum centred on modelling and carving from nature, Garth embarked on a largely solo exploration of what sculpture could be. Over the next few years, his central preoccupation became the creation of sculptural forms that carried no reference to things in the world. In exploring this problem, Garth found painting, and particularly American Abstract Expressionism, offered the most interesting and exciting dialogue with his practice. His work quickly achieved recognition. Within two years of leaving the Slade in 1960, Garth was taken on by the prestigious Rowan Gallery. Since these earliest days, he has nurtured a dialogue between sculptures displayed in a single space, creating an installation from individual pieces in a given series. This new assemblage at Poussin Gallery mixes up the original groups of works thereby offering an opportunity to reconsider their impact then and now. An important early discovery for Garth was the new medium of fiberglass. He found its versatility exciting and particularly liked the fact that it was lightweight and entailed relatively simple techniques, giving him the freedom to work alone. Garth was keen to draw a definitive line under Moore and Hepworth's truth to materials and the "over-personal and over-emotional" modelling technique characterizing bronzes by Bernard Meadows, Reg Butler and others of that generation. In consequence, he strove to create a clean surface, also ignoring fiberglass's associations to industrial processes and to surfing, with its attendant Californian counter-culture. In these respects, his work is aligned with sculptors trained at St. Martin's and associated with Anthony Caro, such as Phillip King, William Tucker and David Annesley - that is to say, the artists later dubbed the 'New Generation' because of their inclusion in the eponymous Whitechapel Art Gallery exhibition in 1965. In the cliquish London art scene of the mid-Sixties, these shared tendencies were eclipsed by the real and presumed connections between Garth's practice and European constructivism. This art theoretical positioning arose from his interest in making series of sculptures using compositional “rules” based on geometry and the Golden Section to arrive at non-referential forms. However, the ideas and processes underpinning Garth's works were more complex and intuitive than the dry, rationalist perception of Constructivist theory. One obvious sign of this was his simultaneous, and apparently paradoxical, engagement with Abstract Expressionist painting. For the first couple of years after leaving the Slade, Garth worked exclusively in relief, developing ideas that he had begun to investigate whilst still a student. White Reliefs 1 and 2 (c.1964-65) are the culmination of this body of work. The impulse behind these pieces reflects a marriage between his constructivist-based interest in problems of form and his Abstract Expressionist-inspired explorations of sculpture's material presence. 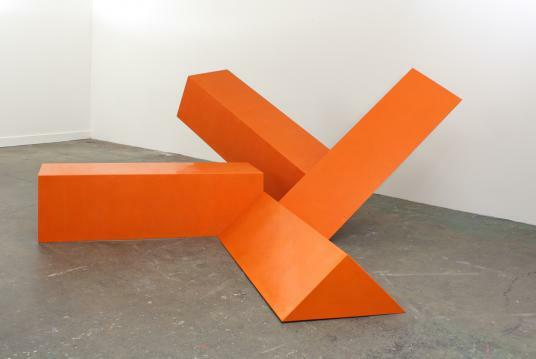 Babar (1965), started about the same time as White Reliefs 1 and 2, is one of four sculptures in which it appears that an elongated block with a square profile has been bent and torqued. Although this series was critically well received, Garth was soon dissatisfied by these works. In retrospect, he disliked the false narrative implied by the materials, namely that a soft state had preceded the present hardened one, whereas in reality the pieces had been moulded exactly as seen. As a result, Garth eliminated these tendencies by applying pre-defined geometries more strictly to the next series represented here by Untitled no. 38 (1967-68). The triangular blocks form two 90° pairs with the same overall dimensions (approx 2ft x 12ft x 6ft) and their positioning relative to each other is determined by the angle at the point they adjoin. The third floor piece, 12 Cones (White) (1968) belongs to a group exploring different spatial relationships between paired or single cones. In the related sculptures, the cones are balanced on their rims in an open ring or square, touching only at their tips. 12 Cones (White) with its compacted, internalized composition, comprising multiple cones of varying dimensions clustered together in a single continuum of forms, is the odd one out – the rules applied, but to the opposite effect. This highlights the fact that the seemingly rigid quality in Garth's work was always tempered by a willingness to follow new avenues of exploration, however tangential. There is also a dry humour that weaves its way through his practice, undermining or, at the very least, complicating, its compositional rigour. For example in Babar there is a play between title and form in the way the elongated block reaches and probes like its namesake's trunk. Likewise, Made of Honor (1965) brings to mind a vibrantly coloured, over-sized chess piece and Party Piece (1965) resembles an arch that has performed an acrobatic twist. This is not really a surprise in that Garth wished to distance himself from minimalism, which he considered "the impulse to stack things up". Rather, his concern was to make sculptures that arose inexorably out of his chosen elements, creating objects that were non-referential and yet exuded the inevitability of natural forms. This can be felt, in part, in the confident and powerful way his works occupy and interact with the surrounding space. Deep morphological resonances also emerge in the works' forms and compositions. For example, Babar's kinked elongated block balances apparently poised between further compression or expansion like the movement of a snake. In Untitled no. 38 the branching, triangular forms tilt and splay, radiating out from a central point echoing the nodal construction of a tree or plant, whilst the spiralling configuration of 12 Cones (White) evokes the rhythmic arrangement of cellular structures or the inner architecture of a seashell. There is another hint of the biomorphic in the sculptures' evocative, sensory appeal. Babar's acid yellow is the colour of a barely ripe lemon and the deep orange of Untitled no. 38 has the earthy richness of an oriental bazaar. Again, although the surface of the fiberglass is candidly synthetic, it has a delicate sheen and softness that invites the viewer's touch. There is a still finer line between the sensuous and the sensual in White Reliefs 1 and 2. Here shapes distantly recollecting the Ying and Yang embrace the corners of a smooth, finely grained skin, seeming to enfold the work in a tender embrace. This playful exploitation of the resonances of sculpture's skin, informed by his early experience of paintings by Jackson Pollock, Franz Kline and Willem de Kooning, would become an increasingly central theme in Garth's later practice. Other sculptors who were influenced by painting at this time were using pigment to superimpose a membrane of colour over their materials to unify the surface or to articulate three-dimensional form. Although Garth did both of these things, his attention was primarily focused on the formal and expressive parallels between the canvas and sculpture's skin. Over the next decades, following a seismic shift in his practice around 1970, Garth explored this correspondence, in doing so challenging and stretching surface as the enveloping boundary of sculptural form, approaching it as a skin to be manipulated, colored, broken, penetrated or affirmed. This text has been enriched by discussions with Garth Evans, Robin Greenwood and Rhona Warwick.